Stunting is one of the main nutritional problems caused by malnutrition in children under 5 years old. Risk factors of stunting influenced by socio-economic, Infant and Young Child Feeding (IYCF), child illnesses, Water Sanitaon and Hygiene (WASH). These factors vary considerably accros the nation in southeast asia. The aim of this study was to determine the factors affecting in stunting of children (0-59 months) in Southeast Asia. It is needed to identified the right intervention. This systematic review was conducted using the Preferred Reporting Items for Systematic reviews and Meta-Analysis (PRISMA) guidelines. Articles were searched by using pubMed database. The literature search outline in the methods indentified 14.790 arcles discuss stunting. We identified 60 articles potentially met all criteria using PubMed advanced search strategy. A total of 60 articles were retrieved from one database (PubMed), 11 articles met the inclusion criteria for stunting in Southeast Asia countries. In our review socio-economic status was reported as one of consistent factors associated with stunting in Cambodia, Myanmar, Indonesia, Laos, Thailand, and Malaysia. Low household income and lack education of mother influenced inappropriate IYCF practice, poor hygiene and sanitation, and care of child illnesses. Improving like income and maternal exposure to nutrition and health information especially for the topics of growth and development, appropriated IYCF, hygiene, sanitation, and child illnesses are required for continuous improvement in a specific strategy that involves many factors. Barennes H, Simmala C, Odermatt P, Thaybouavone T, Vallee J, Martinez-Aussel B, et al. (2009). Postpartum traditions and nutrition practices among urban Lao women and their infants in Vientiane, Lao PDR. Eur J Clin Nutr. Mar;63(3):323–31. Bhutta ZA, Das JK, Rizvi A, Gaffey MF, Walker N, Horton S, et al. (2013). Evidence-based interventions for improvement of maternal and child nutrition: What can be done and at what cost? Lancet.;382(9890):452–77. Black RE, Victora CG, Walker SP, Bhutta ZA, Christian P, De Onis M, et al. (2013) Maternal and child undernutrition and overweight in low-income and middle-income countries. ;382(9890):427–51. Lancet. Bryce J, Coitinho D, Darnton-Hill I, Pelletier D, Pinstrup-Andersen P. (2008). Maternal and child undernutrition: effective action at national level. Vol. 371, The Lancet. . p. 510–26. Chaparro C, Oot L, Sethuraman K. (2014). Overview of the Nutrition Situation in Seven Countries in Southeast Asia . ; Available from: https://www.fantaproject.org/sites/default/files/download/Southeast-Asia-Nutrition-Overview-Apr2014.pdf, Washington DC. Ikeda N, Irie Y, Shibuya K. (2013). Determinants of reduced child stunting in Cambodia: analysis of pooled data from three demographic and health surveys. Bull World Health Organ. May;91(5):341–9. Kamiya Y. (2011). Socioeconomic determinants of nutritional status of children in Lao PDR: effects of household and community factors. J Health Popul Nutr. Aug;29(4):339–48. Limwattananon S, Tangcharoensathien V, Prakongsai P. (2010). Equity in maternal and child health in Thailand. Bull World Health Organ. Jun;88(6):420–7. Ramli, Agho KE, Inder KJ, Bowe SJ, Jacobs J, Dibley MJ. (2009). Prevalence and risk factors for stunting and severe stunting among under-fives in North Maluku province of Indonesia. BMC Pediatr. Oct;9(1):64. Rawat R, Nguyen PH, Tran LM, Hajeebhoy N, Nguyen H Van, Baker J, et al. (2017). Social Franchising and a Nationwide Mass Media Campaign Increased the Prevalence of Adequate Complementary Feeding in Vietnam: A Cluster-Randomized Program Evaluation. J Nutr. 147(4):670–9. Reinbott A, Kuchenbecker J, Herrmann J, Jordan I, Muehlhoff E, Kevanna O, et al.(2015). A child feeding index is superior to WHO IYCF indicators in explaining length-for-age Z-scores of young children in rural Cambodia. Paediatr Int Child Health. May;35(2):124–34. Sahanggamu PD, Purnomosari L, Dillon D. (2017). Information exposure and growth monitoring favour child nutrition in rural Indonesia. Asia Pac J Clin Nutr. Mar;26(2):313–6. Stevens GA, Finucane MM, Paciorek CJ, Flaxman SR, White RA, Donner AJ, et al. (2012) Trends in mild, moderate, and severe stunting and underweight, and progress towards MDG 1 in 141 developing countries: a systematic analysis of population representative data. Sep 1;380(9844):824–34. Available from: http://www.ncbi.nlm.nih.gov/pubmed/22770478 Lancet (London, England). Torlesse H, Cronin AA, Sebayang SK, Nandy R. (2016). 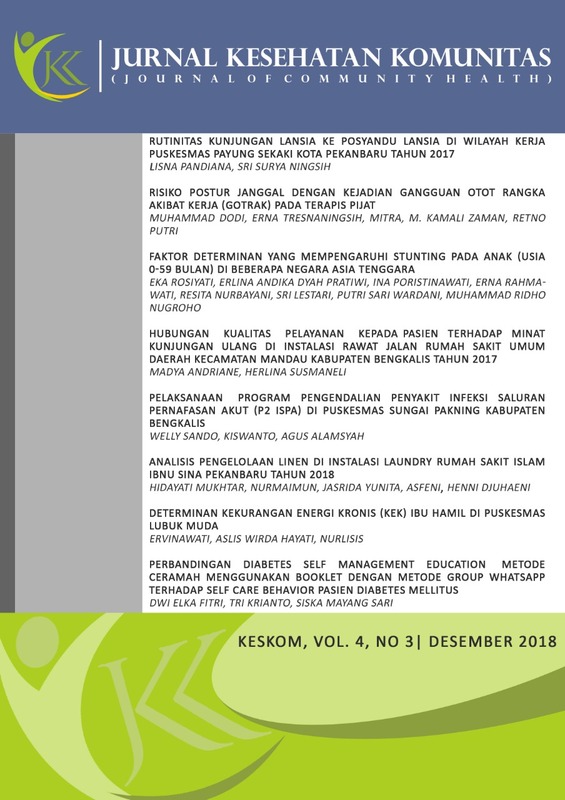 Determinants of stunting in Indonesian children: evidence from a cross-sectional survey indicate a prominent role for the water, sanitation and hygiene sector in stunting reduction. BMC Public Health. Dec;16(1):669. Zhao A, Gao H, Li B, Zhang J, Win NN, Wang P, et al. (2016). Inappropriate Feeding Behavior: One of the Important Causes of Malnutrition in 6- to 36-Month-Old Children in Myanmar. Am J Trop Med Hyg. Sep;95(3):702–8.